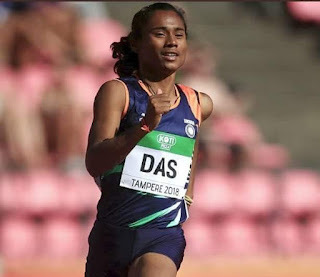 Hima Das (born 9 January 2000 in Nagaon) is an Indian sprinter. She is the first Indian track and field athlete to win a medala at any global event. Hima Das won gold medal in women's 400m at World U-20 Championships 2018 at Tampere, Finland, Clocking a time of 51.46 seconds. She also competed at the 2018 Commonwealth Games in both the 400 metres and the 4x400 metres relay. In the 400 metres Das qualified for the final where she finished sixth in a time of 51.32 seconds, 1.17 seconds behind gold medalist Amantle Montsho from Botswana. In the 4x400 metres relay she was part of an Indian teamthat competed in the final where they finished seventh in a time of three minutes and 33.61 seconds.